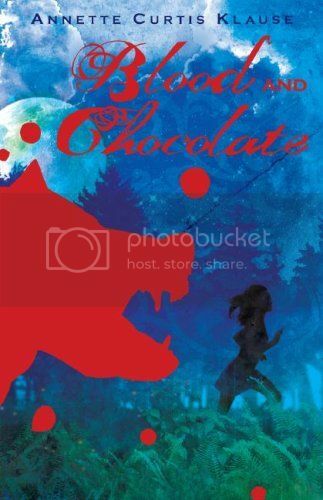 Blood and Chocolate by Annette Curtis Klause - Vivian Gandillon is a werewolf. Her pack has been leaderless since the death of her father. As well as having to deal with her grief, she also has to listen to the arguments that arise over who will take over, and it irritates her beyond belief. If that wasn't enough, she also has the young wolves of the pack sniffing after her. But then she meets Aiden, a human with a passion for all things magical. Vivian soon falls in love and dreams of showing him her other form. He's bound to love her even more for being this magical, beautiful creature, right? However things get turned upside down when a murder threatens to expose the pack for what they really are. Caught in the middle, Vivians actions can endanger both human and wolf, and she needs to decide who she is, and where her loyalties lie. I really loved this book! I thought it was amazing. As the book is from a werewolf's point of view, you understand their lives and your sympathies lie with them in certain aspects, and it takes away the stereotype of werewolves being monsters. Readers can identify with Vivian in her uncertainty as to who she is, we can understand her love for both worlds, and her anguish at them being seperate. The emotions were very true to life, and he suspence over the murder and what the effect will be on the pack is brilliant. You'll be sitting on the edge of your seat and worrying along with Vivian as both her worlds collide with catastrophic consequences. It's a great read, and I highly recommend it.